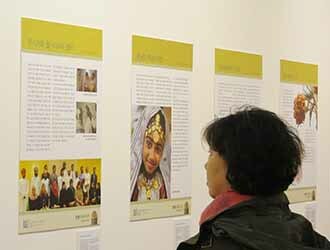 The exhibition at Korea Foundation Cultural Center was sponsored by the Embassy of the Sultanate of Oman to Korea, and hosted by the Korea Foundation. 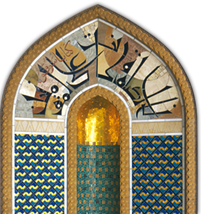 With the sponsorship of the Omani Embassy, the exhibition was greatly enhanced to include original artworks, photography, paintings, manuscripts and facsimile prints, shadow art, model dhow boats, the Omani daggar (khanjar) and coffee service, symbolic of Arab hospitality, and panels borrowed from another touring exhibition with the theme "Modern Oman." 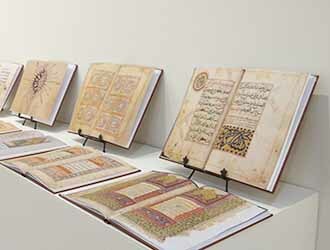 Videos on "Religious Tolerance in Oman" and the history of Oman, depicted visually through sand art, were also presented. 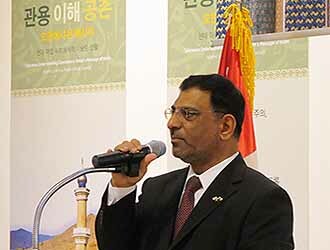 At the opening ceremony on November 4th there were more than 150 distinguished guests and visitors in attendence, including government representatives from China, Colombia, Georgia, Germany, Turkey and Ukraine, important figures from academia and the media, and religious leaders of various denominations. 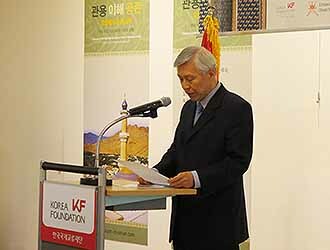 On behalf of the Korea Foundation, the President, Dr. Hyun-Seok Yu; the Executive Vice President, Zeon Nam Jin, and the Director of the KF Cultural Center, Choi Hyun-soo offered opening remarks, along with HE Lee Kyung Soo, the Deputy Minister for Political Affairs, from Korea's Ministry of Foreign Affairs. The Sultanate of Oman was represented by HE Ambassador Mohamed Al-Harthy, and the Ministry of Endowments and Religious Affairs by Sheikh Mohammed Said Al-Mamari.